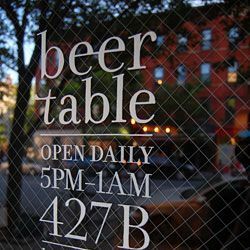 First, a little bad news for Brooklyn beer nerds: Because of a snafu with the community board and SLA, Beer Table in Park Slope is temporarily dry (owner Justin Philips tells us it’s just a paperwork issue, and he hopes to have everything sorted out by mid-month). But starting today they’re going to make the best of it and begin offering a revamped lunch and brunch service, Wednesday through Sunday, between 11 a.m. and 6 p.m., care of a brand-new chef, Jamie Klotz. So, yes, anyone in Brooklyn hoping to pop in for a quick Dieu du Ciel Route des Epices or Mikkeller Chinook IPA might be out of luck, but in the meantime you can get dishes like a spicy duck sandwich with chipotles, raisins, and mayo; or sauteed beet greens with radishes, bacon, and eggs. So it’s not exactly a terrible trade-off, plus maybe your liver needs a break after the holidays? We know ours does.